Tee's Blurbs: [J&K] it's all in the details. 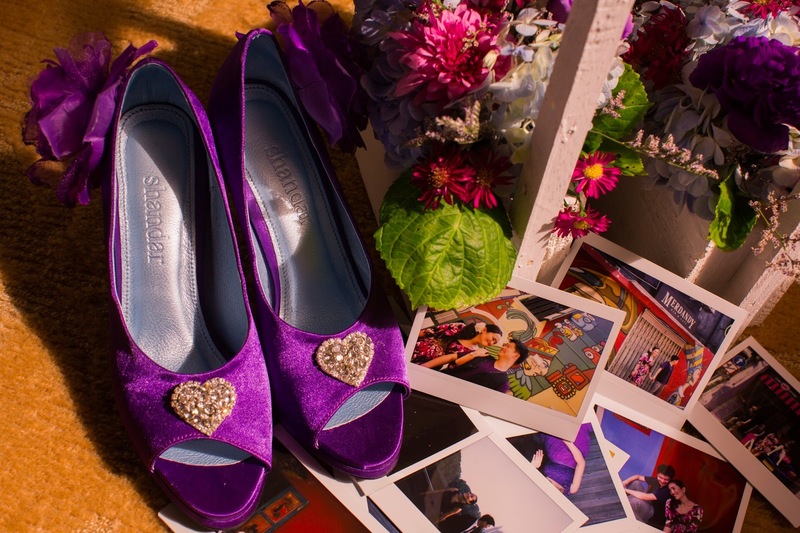 Customized Purple Bridal Shoes by Mark Tenchavez of Shandar. The kikay and girly bride that I am, I wanted something to pop out from my off-white ensemble and early on, I knew I was getting colored shoes and nothing and no one would be stopping me from that. I wanted to still match the motif so I selected purple, one of the motif colors and one of my fave ones too. I then requested Mark to add a teensy details like add "J" and "K" on the soles, just because. Cheesy, I know. Looking for "THE" shoes had been one ordeal for me. I never found the ones in stores no matter how hard I looked! And then it hit me, if you can't see "THE" one, you can always make "THE" one! And yeah, *cross fingers* on this one! Mark sure has talent, though most of his designs are edgier and on the eccentric side. Though the fabric did not exactly match the swatch I first selected (mine's on a bit lighter shade), I am quite happy with how the shoes came out. I have to admit I was at first disappointed when I first saw my shoes so I had it reworked again. It wasn't per specifications, and I am very much into details - instead of of initials the soles had "I" "do" in them, and in place of the huge studded heart was an outline of two hearts! It just wasn't the pair I had envisioned and what was sketched! But as requested after I explained my predicament, he worked on them again and this time, he got me - FINALLY! Mark is one of those suppliers who stands by his deliverable dates, and asks his clients how his product is. As someone who's into schedules and everything, that is a plus. I am also quite amazed on how my feet did not hurt after wearing the shoes the whole day, at 3 inches at that! I wore it during the ceremony and the reception - until 11+pm when all the guests had left, minus for less than 30 minutes after the wedding ceremony wherein I changed into my ever-reliable backup Suelas for the post-nup shoot. My mom teases me that I can't wear these pretty shoes again, but I beg to differ. One day, I will and I shall strut in these purple cuties and it'd still be perfectly fine. Price-wise, at first I thought it'd cost $$$ to have customized shoes, one by Shandar at that, knowing that Mark's brand has been making buzz in the Cebu scene already. But surprise! The price is fairly reasonable and not that bad as well. 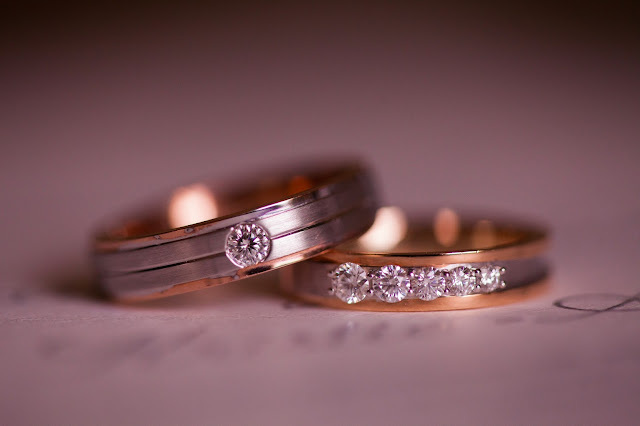 Destinee Wedding Bands from Lee Hwa Jewelry. H is band is the one with the lone diamond while I had the assymetrical diamonds. Both rings are set on white gold and rose gold. These are the rings I was talking about in one my posts, the ones we both fell in love with when we first saw them. Sooo kilig! Ours are not matchy-matchy, mainly because we picked out two different rings and declared them a match! So typical of us! haha! I guess this speaks on how unique we each are and yet somehow, we complement each other. Match made in heaven, indeed! I love our rings and Lee Hwa's service is good. Downside though, is that my ring and I, we did not get along at the beginning (let's just put it at that!) because after a couple of days wearing it, one diamond literally falls off! After waiting to get back to SG and spending $50 to have it fixed and waiting for 10 working days for it to complete (torture!!! ), it comes back to me fixed, or so I thought. Two days after, the same diamond falls off again. Twice, and we haven't hit the first month of married life yet! So I'm not sure if it's the setting (mounted with shared prongs) or if it's just me and my clumsiness because J's wedding ring (his diamond was embedded) does not have any problems so far. I'm still not sure what to make of the wedding bands because of my loose diamond incidents but Lee Hwa's one of the known jewelers in Singapore, and the rings are beautiful and pretty and all that, but let's just wait and see. I guess the lesson learned here is that it pays to be careful and if you're the clumsy type like me yet you insist on having pretty diamonds on your band, maybe embedded diamonds works for you better than mounted ones. But now, it's been almost two months since it's last visit to the jeweler's and the diamond is still holding out, so I'd like to think (and hope) that maybe, the worst part had already passed. Aqua blue blind embossed swirl borders and embossed gray text printed on 300/280 gsm Old Ivory Mill paper. It was painless collaborating with Corinne via exchange of emails. She gets me and what I wanted from my peg - nothing too flashy, just simple embossed text with turquoise swirl borders. Not only that, she outdoes herself by suggesting better designs over the previous designs she had first given me! Whoa, at first, the confused me because I was now facing a lot of good choices! 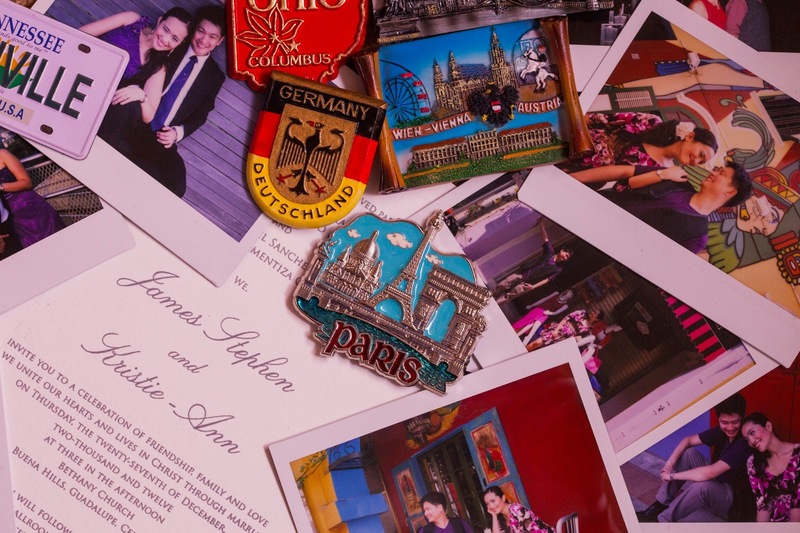 The price is not that bad too, we had the main invites, entourage page, RSVP cards as part of the invitation set. We went through our revisions and corrections all via email too! She's one of those suppliers that can work for you and can easily collaborate with through emails, so despite our LDR status (they are in Cebu, I am in Singapore), we were able to collaborate just fine! Because we were so happy with her service and I loved the feel of the paper (it would have been nicer on letter-press printing too) that I decided on the last minute to order thank-you cards from her as well. And yes, after being "chummy-chummy" via emails we finally met when we got the printed invitations. Just like that, no sample prints and what-have-you's. I trusted her and she kept her part of the deal. One thing though, it would have been nicer if they did letter-press printing too (one of my frustrations, i know). But as of now, CDI DESIGNS don't offer letter-press printing, but I don't take it against them. I definitely would recommend them for their services and professionalism. Photographs by our cool photographer, Mark Cantalejo. Hi. May I ask if the wedding band for the bride is also a destinee ring from lee hwa jewelry? Hello, thanks for dropping by! Yes, the bride and groom's rings are Destinee rings from Lee Hwa.